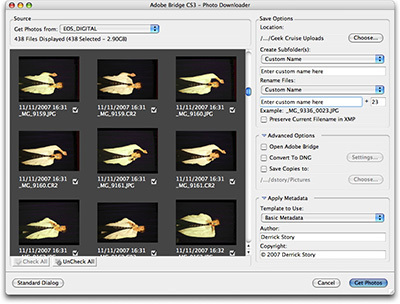 Hidden in the depths of your Bridge 2.0 folder is a nifty application called Photo Downloader. 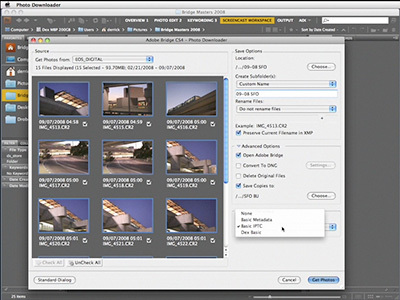 If you use the Bridge/ACR workflow, this gem can handle importing images from your memory card, and it provides many of the same options that are available in Lightroom's Import dialog box. The coolest thing is, if you've upgraded to CS3, you already have all the components needed to build a nifty workflow: Photo Downloader to import images, Bridge 2.0 to organized them and fine-tune metadata, and ACR 4 to process your RAW and Jpeg files. Photo Downloader launches and reads any card attached to your computer. It enables image placement to any location you want, allows file renaming on import, provides for automated backup to a separate drive, and even lets you add IPTC metadata to your pictures, so your copyright and contact information is included right from the start. Other handy features include thumbnail previews of the images on the card, selective uploading, and even on-the-fly conversion to DNG. Not bad for a little app that many photographers don't even know they have.